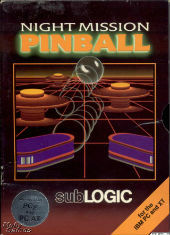 Night Mission Pinball is a pinball game simulation. You can change many physical parameters of the machine to suit your playing style or your whim such as the number of balls, the incline of the machine, the kick off the bumpers, etc. It supports 1-4 players and is controlled by the keyboard or joystick. In 1988, an upgraded v3.0 was released.